advantages and benefits of this new technology can be fully exploited. increase in the ferric concentration are required. in the conventional high temperature process. microporous or mesoporous size, tailor-made acidity or basicity, and high thermal stability. Microwave-assisted synthesis has been attempted on a certain types of molecular sieves. phases appeared as the processing proceeded. were achieved compared to conventional reflux method. catalyze the process, it still takes over 10 h or several days to get the polymerization completed. polymer at 180°C in 30 min. The yield attained 90% and the average molar mass is 124000g/mol. than those of the conventionally produced polymer. conventional thermal approaches of identical conditions. 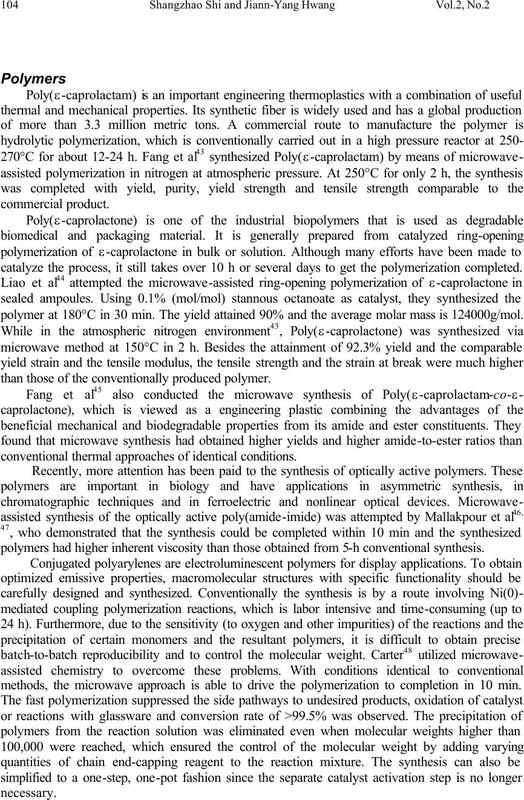 polymers had higher inherent viscosity than those obtained from 5-h conventional synthesis. 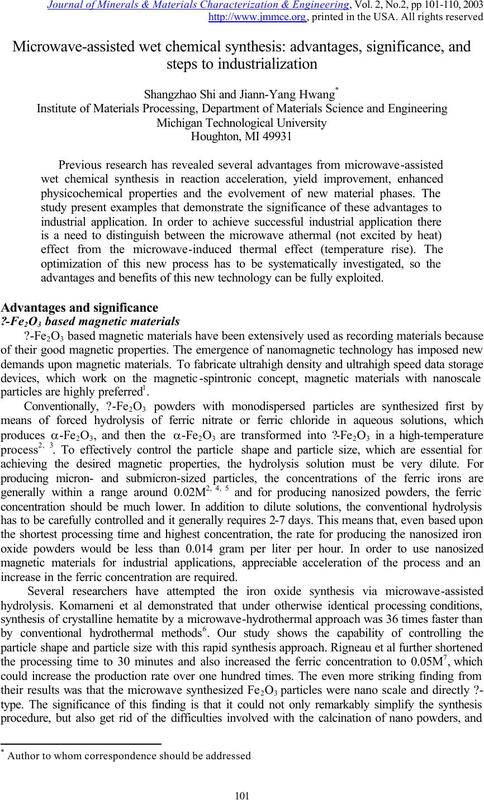 methods, the microwave approach is able to drive the polymerization to completion in 10 min. conventional methods, that wide application of this technology in industry is a certainty. assisted solid state processing, is therefore completely eliminated. 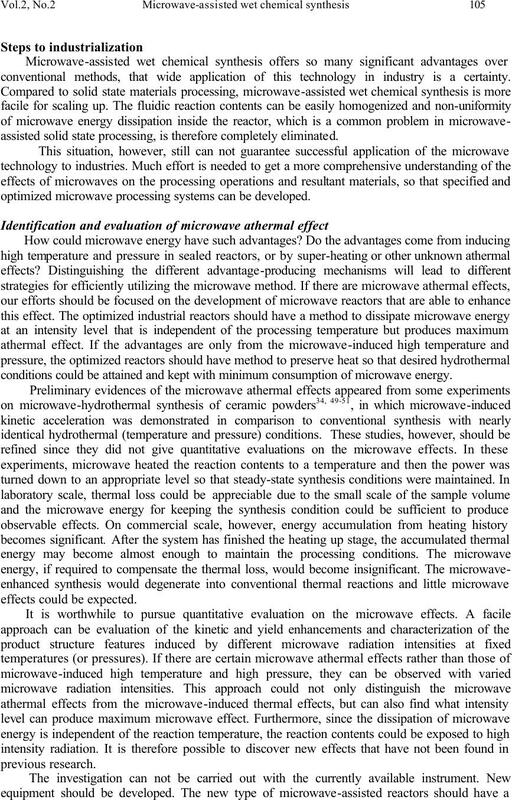 optimized microwave processing systems can be developed. conditions could be attained and kept with minimum consumption of microwave energy. coolant to the microwave energy nor shield the reaction contents from the microwave radiation. and the later stages, may differently affect synthesis kinetics as well as the synthesized structures. kinds of energy could be an optimal strategy. capacity equipment is commercially available and the equipment cost is cheaper. 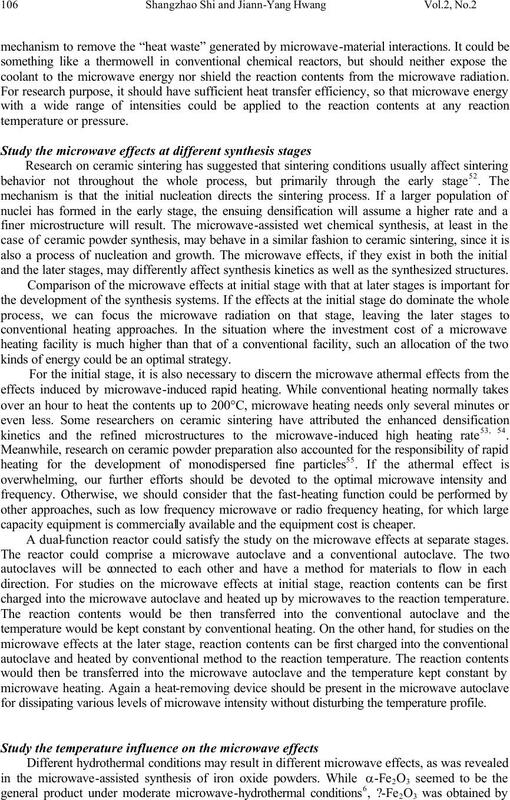 A dual-function reactor could satisfy the study on the microwave effects at separate stages. charged into the microwave autoclave and heated up by microwaves to the reaction temperature. for dissipating various levels of microwave intensity without disturbing the temperature profile. possible to find more benefits that have not yet been revealed. systematic research in this regard. Society of Powder and Powder Metallurgy, 45  615-617 (1998). 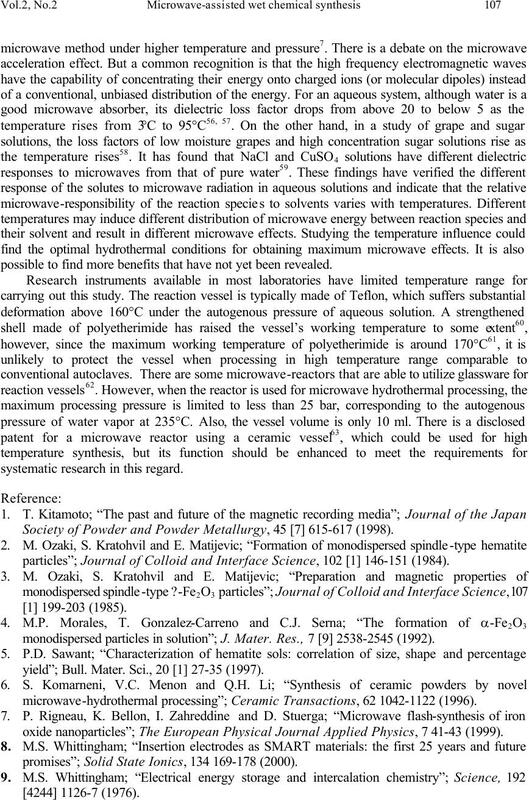 particles”; Journal of Colloid and Interface Science, 102  146-151 (1984). monodispersed particles in solution”; J. Mater. Res., 7  2538-2545 (1992). yield”; Bull. Mater. Sci., 20  27-35 (1997). 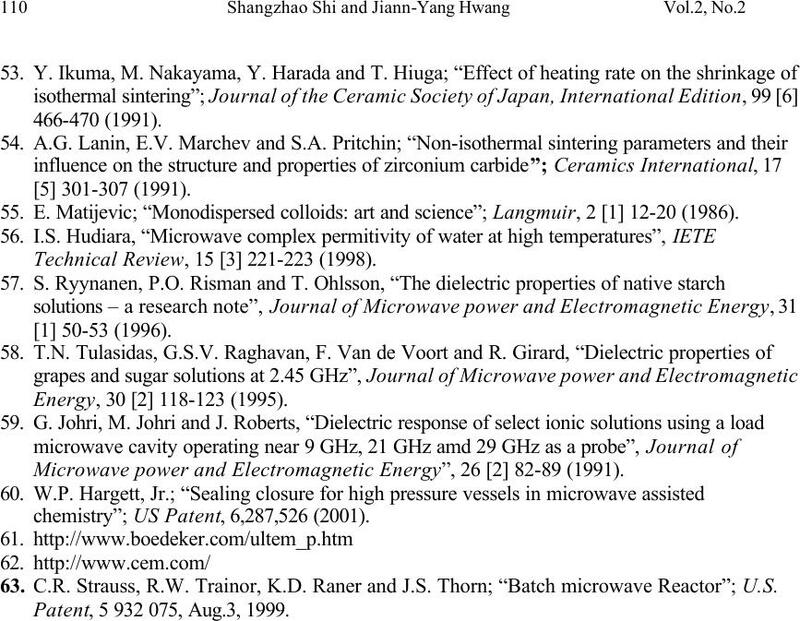 microwave-hydrothermal processing”; Ceramic Transactions, 62 1042-1122 (1996). oxide nanoparticles”; The European Physical Journal Applied Physics, 7 41-43 (1999). 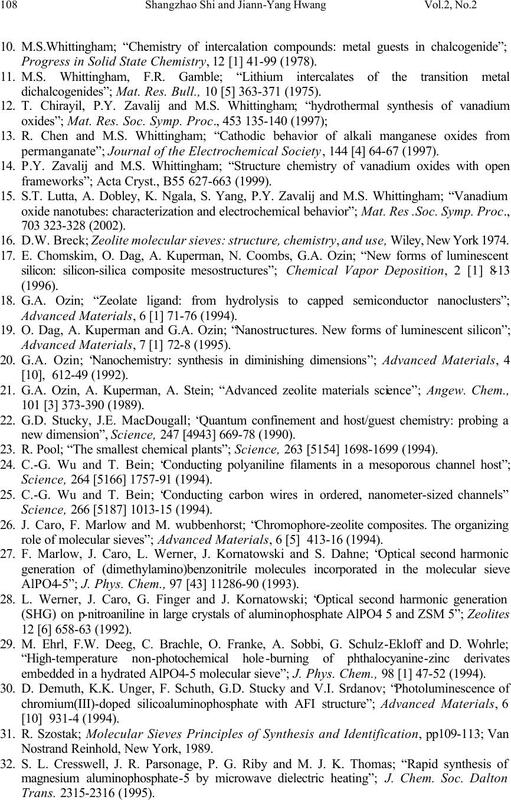 promises”; Solid State Ionics, 134 169-178 (2000). Progress in Solid State Chemistry, 12  41-99 (1978). dichalcogenides”; Mat. Res. Bull., 10  363-371 (1975). permanganate”; Journal of the Electrochemical Society, 144  64-67 (1997). frameworks”; Acta Cryst., B55 627-663 (1999). 16. D.W. Breck; Zeolite molecular sieves: structure, chemistry, and use, Wiley, New York 1974. Advanced Materials, 6  71-76 (1994). Advanced Materials, 7  72-8 (1995). new dimension”, Science, 247  669-78 (1990). 23. R. Pool; “The smallest chemical plants”; Science, 263  1698-1699 (1994). 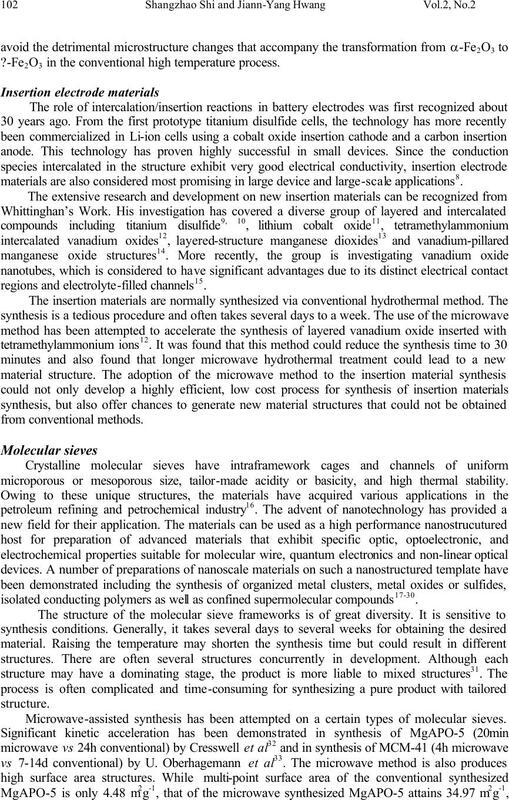 role of molecular sieves”; Advanced Materials, 6  413-16 (1994). AlPO4-5”; J. Phys. Chem., 97  11286-90 (1993). embedded in a hydrated AlPO4-5 molecular sieve”; J. Phys. Chem., 98  47-52 (1994). Nostrand Reinhold, New York, 1989. 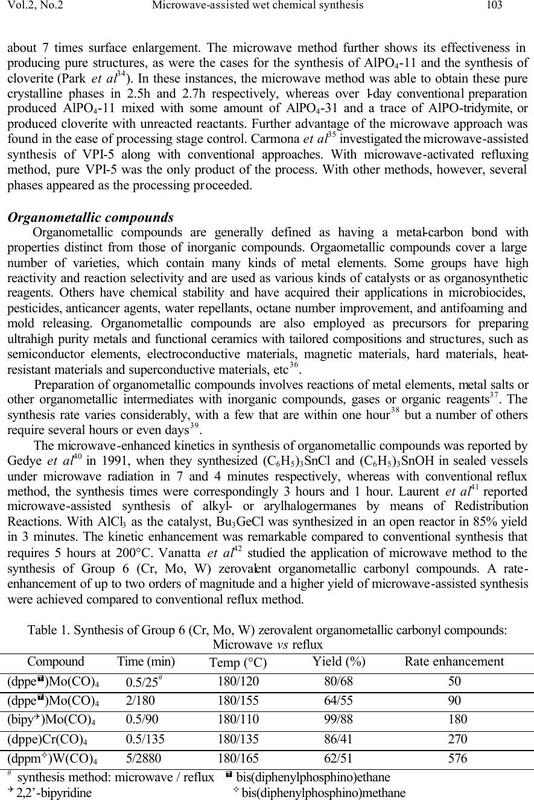 VPI-5 using conventional and microwave heating techniques”; Zeolites, 18 340-346 (1997). Macmillan Publishers Ltd., London (1986). 340; John Wiley & Sons, Inc., New York (1998). 39. I. Omae; ibid; pp75, 85, 257, 261, 289, 338, 306, 321. Synthesis”; Journal of Microwave Power and Electromagnetic Energy, 26  3-17 (1991). Polymer Science: Part A: Polymer Chemistry, 40 2264-2275 (2002). A: Polymer Chemistry, 39 177-186 (2001). 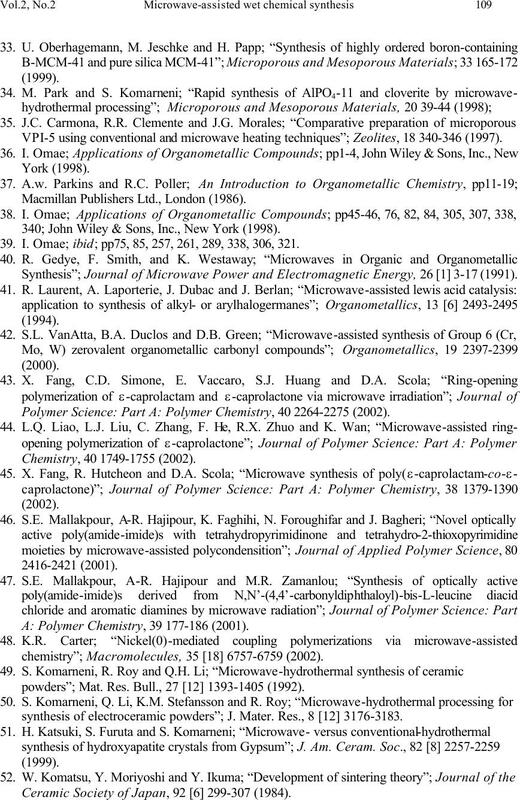 chemistry”; Macromolecules, 35  6757-6759 (2002). powders”; Mat. Res. Bull., 27  1393-1405 (1992). synthesis of electroceramic powders”; J. Mater. Res., 8  3176-3183. Ceramic Society of Japan, 92  299-307 (1984). 55. E. Matijevic; “Monodispersed colloids: art and science”; Langmuir, 2  12-20 (1986). Technical Review, 15  221-223 (1998). Microwave power and Electromagnetic Energy”, 26  82-89 (1991). chemistry”; US Patent, 6,287,526 (2001). 63. C.R. Strauss, R.W. Trainor, K.D. Raner and J.S. Thorn; “Batch microwave Reactor”; U.S.
Patent, 5 932 075, Aug.3, 1999.